Baby Boomers aren’t faced with the same reputation as millennials today. That’s because they weren’t born into a world where smartphones were the key to every question. The truth of the matter is, majority of boomers are actually strongly connected to technology. According to Pew Research Center, 82% of seniors between 65 and 69 have internet in their homes. For seniors who use the internet, 71% go online daily. That’s compared to some 90% of millennials who access the internet every day. As you can see, boomers aren’t as disconnected as society may have once believed. They’ve quickly learned to accept technology and make the most of it. As more and more seniors turn to the internet to discover information about medical issues, health care and senior housing, this means that online competition for the senior housing sector is growing more intense. It’s time to start focusing on what marketing efforts will have the most impact on your community. Put your senior living community on the map with our step-by-step Google My Business checklist. With senior living community developments on the rise, getting in front of seniors and their families is essential. The challenge, however, is that 60% of people searching for senior care have little to no knowledge of their local options. It’s up to senior living providers to educate consumers about these options, whether they’re local or not. Your community’s online presence should be about more than just standing out against the rising competition. It’s about educating seniors and families about your community as a viable option, but doing so in a way that meets their expectations as connected consumers. Investing in your SEO efforts is a good place to start. From reviews to cleaning up your Google My Business listing, these tactics can go a long way to straighten out your online presence. Google listings need more to climb to the top. Fifteen percent of people searching for senior housing begin by searching directly for a community, while 73% search a general term (e.g., “assisted living” or “independent living”). A Google listing is the first result that will appear when searching for a company directly, which increases the need that your community’s business listing is top notch. Reaching those that are searching for general terms is where your Google listing needs more attention. According to Caring.com, some 29% of seniors searching for general senior living terms visit all sites that turn up, always starting with the first one. Being that first one, however, is the challenge. Sixty percent of consumers say local search results with great images capture their attention and give that extra push toward a decision. Listings with unique digital content, like photography or virtual tours, help your company climb to the top and even educate seniors on your community with a visual, interactive experience. Senior living directories need attention. Of seniors that are searching a general term, 21% go on to browse a senior housing directory. That doesn’t include consumers also browsing Yelp, YellowPages and other third-party local directories. This is where you can educate seniors and families about your community with an overview of its offerings, photos and reviews. Reviews are educational. According to Caring.com, a survey found that 78% of seniors believe the best information comes from company customers. Reviews are telling. That’s why it’s essential to make sure you’re not only receiving positive feedback, but that reviews can be found about your community across the web and senior housing directories. Pumping resources into local SEO will produce impressive results, but how do you go beyond your local market? Educating seniors in a way that is not only unique, but beneficial to their well-being will pay off in the long run. Your community’s online presence stretches far beyond Google. 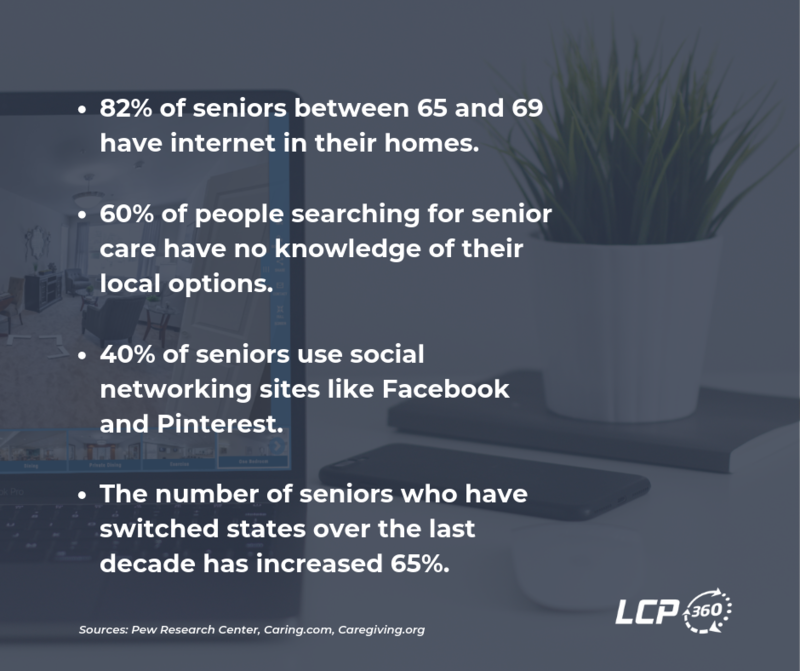 Seniors are using the internet to connect on a persona level, too, with 40% of seniors using social sites like Pinterest and Facebook. In fact, seniors are on social media for a variety of reasons: to connect with long-distant relatives, nurture relationships, for entertainment and yes, to even educate themselves. While a major reason seniors access the internet is to find information, but social networking is key to your community’s online growth because it’s just another channel for that information. Whether they happen to stumble across your community’s Facebook page, or choose to browse it for an idea of what your community culture is like, having an established social media presence may be that extra push someone needs. It’s worth considering that not only are seniors actively online searching for health care and medical information, but so are their families. They’re using social media to browse your community, too. A clean and active presence on networking sites goes a long way. It’s estimated that 34 million Americans are caregivers of an older parent, and 15% live one or more hours away. What’s more, the number of seniors who have switched states over the last decade has increased 65%. Coordinating care for aging seniors that are states away has become the ultimate challenge for adult children, but thanks to our connected world, it’s getting easier. Seniors with access to smartphones and tablets are able to video call and connect with relatives in meaningful ways. 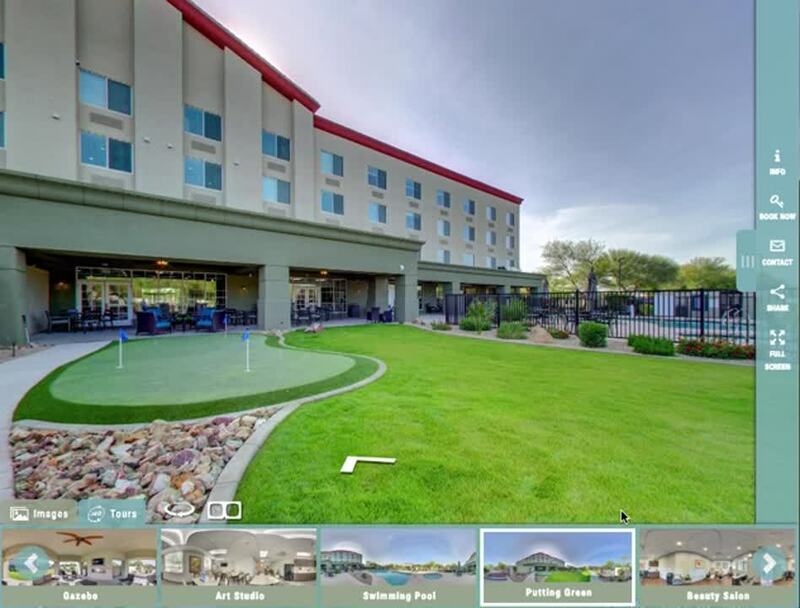 Similar to these types of connective experiences, 360 virtual tours of senior living communities are playing a proactive role in long-distance parent-child relationships. The ability to virtually tour a community from any location at any hour of the day from a laptop or tablet device gives a whole new meaning to being hyper-connected. Aging seniors who are immobile or don’t live near their adult children desire these kinds of experiences to facilitate the process when it comes time for senior housing, whether that’s independent, assisted living, memory care or skilled nursing. Virtual tours for seniors not only spark interest and engagement, they’re also motivating. With majority of seniors having access to smartphones and tablets, interactive digital content from your community puts them in control. There’s a unique flexibility that comes with experiences where you can tour a community with a 24/7 open house. At the end of the day, it’s no secret that seniors are active online. Seniors have been long embracing technology for decades. Because they weren’t born during an era of smartphones and Google Home assistants, doesn’t mean they don’t have those things or aren’t interested in them. Boomers aren’t as strongly considered when it comes to technology experiences, but that’s quickly changing. It’s up to senior housing providers to stay ahead of the curve to keep online presence a top priority to educate and inform when it matters the most.